What's Up at the Louisville Amusement Park? After being closed for four seasons, Kentucky Kingdom reopened as an independent amusement park in 2014. It is something of a work in progress as the new owners continue to rehab existing rides and introduce new ones. Six Flags operated the park as Six Flags Kentucky Kingdom from 1998 to 2009 (before that it was independently operated) and closed it before the 2010 season. The folks behind Indiana's Holiday World were going to redevelop the park in 2013 and rename it Bluegrass Boardwalk; however negotiations broke down, and the plans were dropped. Kentucky Kingdom is a medium-sized amusement park. It offers a decent collection of roller coasters and other thrill rides. While its water park is relatively small, it is included with admission and can provide relief (as well as fun) on a sweltering day. A rarity for a park, Kentucky Kingdom features live, trained sea lions in its Aqua Theater. The park features the wooden coaster Thunder Run. In 2016, the former twin-track racing coaster, Twisted Twins, got a makeover into a hybrid wooden-steel coaster. Now featuring an IBox track and known as Storm Chaser, it has been getting favorable reviews. 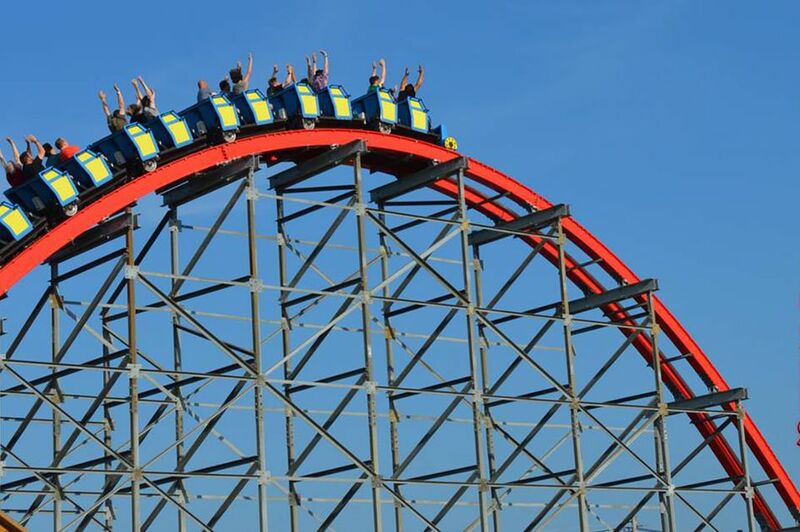 Kentucky Kingdom opened a new steel coaster, Lightning Run, for the 2014 season. The T2 inverted coaster got a makeover and reopened in 2015 as T3. Among the park's flat rides are Cyclos, a pendulum thrill ride, the 130-foot tall SkyCatcher swing ride, an Enterprise, a Himalaya and a Breakdance. Other rides at the park include a 150-foot-tall Ferris wheel, The Raging Rapids river raft ride, and the Mile High Falls splashdown ride. There is also a "5-D" Cinema, which offers ride films such as "Angry Birds." Younger children can head to King Louie's Playland. Rides there include a carousel, the Rio Grande train, and the Whirl-A-Round Swings. In 2014, the adjacent Hurricane Bay Water Park (which is included with admission to the them park) introduced many new slides and attractions including three new water slide towers, a fast-moving adventure river, and a wave lagoon. The water park's highlights are Deluge, an uphill water coaster, and Deep Water Dive, one of the industry's tallest and most thrilling water slides. For the 2019 season, Kentucky Kingdom is debuting Kentucky Flyer, a wooden roller coaster. The family ride will climb 47 feet, reach a top speed of 35 mph, and include 12 airtime moments. Don't let the relatively modest stats fool you. Although the low-profile coaster will have a height requirement of only 40 inches, it is being built by The Gravity Group, the same ride manufacturer that built Wooden Warrior at Quassy Amusement Park. That ride (along with similar Gravity Group coasters) delivers a surprisingly potent—and smooth—experience thanks, in part, to its unique train design. We expect Kentucky Flyer to offer a robust ride as well. In 2017, the park added Eye of the Storm, a Larson Looper ride. Passengers in a coaster-like train travel forwards and backwards around a 73-foot-tall loop. Kentucky Kingdom offers the usual park fare, including hot dogs, pizza, burgers, and tacos. Those with a sweet tooth can find funnel cakes and ice cream. The park's Hurricane Bay Beach Club offers beers on tap as well as tropical frozen drinks. Local brews are served at the Craft Beer Garden along with bourbon (this is Kentucky! ), sandwiches, and other items. A single ticket includes admission to both Kentucky Kingdom amusement park and Hurricane Bay water park. Discounted prices for children (under 48 inches) and seniors (55+). Children under 36 inches tall are admitted free. Season passes are available. Discounts may be available at Kentucky Kingdom's official site. The park is located in Louisville, Kentucky on the grounds of the Kentucky State Fair. It is across from the Louisville International Airport, at the intersection of I-65 and I-264. The address is 937 Phillips Lane in Louisville. In addition to Holiday World, nearby parks include ​Beech Bend in Bowling Green, Kentucky Splash Water Park in Williamsburg, Kentucky, and Kings Island in Mason, Ohio.